Tigerino Nuggies coarse-grained clumping cat litter has larger grains which are leΒ likely to get tracked around the house. The hygienic litter is also ideal for cats with medium and long fur. It is made from 100% natural clay which locks in bad smells. The clay litter has a pleasant, unobtrusive baby-powder smell which makes life more pleasant for pets and their owners. Tigerino Nuggies Coarse-Grained clumping cat litter at a glance: Clumps immediately Very absorbent - 4 x more efficient that traditional litter 100% natural clay Rapidly locks bad odours Free from chemical additives Low dust, coarse grains LeΒ likely to track Ideal for long-haired cats Tips: Make sure your cat's litter tray is somewhere warm and dry. 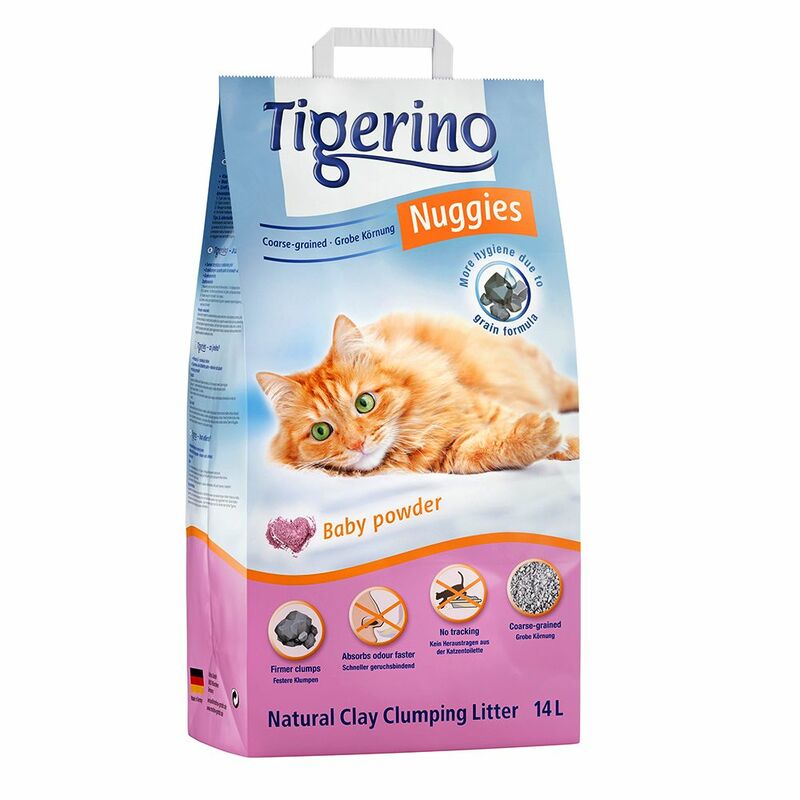 Fast clumping Tigerino Nuggies cat litter forms rapidly into firm clumps which helps to keep the remaining litter clean and dry. Regular removal of clumped litter with a litter scoop will help to keep the rest of the litter fresh and hygienic. Occasionally some cats will have problems changing to a different litter. It helps if you mix the first bag of Tigerino Nuggies with some of the old litter (this can alter the effectiveneΒ of the litter). Using Tigerino Nuggies Cat Litter: 1. Fill the clean litter box with approx. 7cm of Tigerino Nuggies Coarse-Grained Litter 2. Remove soiled clumps at least once a day 3. Clean the litter box approx. once a month 4. Dispose of the litter in your general rubbish, never in the toilet. Please refer to your local regulations for disposal of large amounts of cat litter.